This is my take on cartoons and CGI as well. If there is a CGI dragon, we're not seeing something computer generated. It's a real dragon. And if we are seeing, for example, Daffy Duck in Drew Carey's office, he's not seeing a two dimensional drawing, but a talking humanoid duck. 1954--THE MUPPET MOVIE--Though it came out in 1979, it takes place before Kermit got famous. Kermit first started appearing on talk shows in 1955. This movie shows how he got from the swamps to Hollywood, thus it should be placed here. During their trip to Hollywood, Kermit and Fozzie stop to offer Big Bird a ride. He declines, saying he's on his way to New York, to break into public broadcasting. This shows us that Big Bird was not originally from Sesame Street. This explains why Little Bird is the only similar type of his species to live there (and Little bird didn't arrive until the 1970s.) Big Bird, arriving in New York, must have found he wasn't accepted by New Yorkers, until he found Sesame Street. Once Big Bird found his home, he made it his mission to tell others how to get to Sesame Street. Clearly, it was Big Bird who continued to advocate for the next 15 years until finally PBS agreed to do a live daily educational reality program on Sesame Street. 1969 to November 2009--SESAME STREET--Kermit is a news anchor for Sesame Street News. 1971--THE MUPPETS TAKE MANHATTEN--This movie seems to be another step in the story of how the Muppets got famous. I'm giving a five year period between when the Muppets were successful on Broadway and the time they got their variety show. Kermit apparently marries Miss Piggy at the end with residents from SESAME STREET and FRAGGLE ROCK in attendance. Sesame Street was very successful by this point, and Kermit was still a good friend of them, and still working for the Sesame Street News. 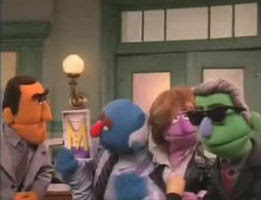 The Muppets and Sesame Street residents would interact with folks from FRAGGLE ROCK over. Uncle Travelling Matt is the only Fraggle to appear here, which fits since most Fraggles probably aren't born yet. This film also features the MUPPET BABIES. This would seem to contradict the Muppet Movie, but since the Muppet Babies were literally babies still, if they were separated and spread across the country after, they probably would not remember each other as adults. I know I don't know any of the children I was friends with when I was ages 0 - 5. This is just a sampling of crossovers and history previously covered in TVCU blogs. For the more detailed history and list of crossovers, please visit the original Sesame Street blog and the original Muppet blog. Another cartoon crossover would occur in 1990, Cartoon All-Stars to the Rescue. This cartoon featured popular characters from children's Saturday morning cartoons, banding together to promote an anti-drug message. ABC, CBS, Fox, and NBC aired this half-hour special one Saturday morning with characters from all their networks, including Huey, Dewey, and Louie (from Disney'sDuckTales), Winnie the Pooh, Tigger, Slimer (from The Real Ghostbusters and Extreme Ghostbusters), Michelangelo (from Teenage Mutant Ninja Turtles), Bugs Bunny, Daffy Duck, Alvin and the Chipmunks, The Smurfs, ALF (from his short-lived cartoon spinoff), Garfield, and the trio of Baby Kermit, Baby Piggy and Baby Gonzo (from Jim Henson's Muppet Babies). Animation companies granted unlimited, royalty-free use of their cartoon characters for this project, a feat that has been unequalled before or since then. This cartoon was also introduced by then-President George H. W. Bush and Barbara Bush, and would be distributed to schools and video stores free of charge nationwide. In Mad episode "Ribbitless", a different explanation is offered for the muppets. They were all ordinary animals who ate butterflies that somehow mutated them into intelligent beings. HCU Comments: This is a mega television crossover event. And despite the silly premise, all the crossed series remain true to the shows and films they come from. There is an appearance of Elong Spengler, president of Waste Busters. He is said to be the brother of Egon Spengler of Ghostbusters and is played by the same actor. And yes, the Muppets are in this. To explain the existence of Muppets in the HCU, I reference the Angle episode in which puppets are brought to life possessed by demons. Or the Buffy episode with a human turned into a dummy. Or Chucky from Child’s Play. Murphy Brown, Doogie Howser, Cheers, the Cosby Show, the Golden Girls, and Married with Children are all standard sitcoms and are brought into the HCU by this cross. Looney Tunes characters are animated drawings brought to life by the Necronomicon ex Mortis based on the film Evil Toons. Back to the Future is already well established as part of the HCU, but his appearance of Doc Brown and his Delorean is a greater confirmation. Nathan Thurm is a character from Saturday Night Live, but just as with the appearance of Father Guido Sarducci, this cross does not bring in the entire cast of characters from SNL. Finally, this cross brings in the loveable alien E.T.